Tromix offers a variety of upper receiver configurations as well as barrels chambered in the hard-hitting .375 SOCOM. My first experience with big-bore AR-15s came 18 years ago. One was chambered in .44 Mag., the other in .50 Action Express. This was back before myriad different AR-15-specific cartridges were introduced, and I found these two thought-provoking. Not only were both hard-hitting accurate and a great deal of fun, but even the rimmed .44 Magnum proved reliable. Both were built by Tromix (tromix.com), which went on to become well respected for its big-bore “lead delivery systems.” Years later, Tromix again raised eyebrows when it brought the .458 SOCOM to market. This impressive cartridge is capable of driving 200- to 500-grain bullets at respectable velocities and quickly became popular with hunters back East. I stil l have my original .458 SOCOM Tromix AR-15, and it remains one of my favorites. It’s nicely made, a great deal of fun to shoot and very hard-hitting. Tromix is owned and operated by Tony Rumore, an automotive hot-rodder who eventually turned his attention to firearms and cartridges—developing his Sledge Hammer family of ARs. 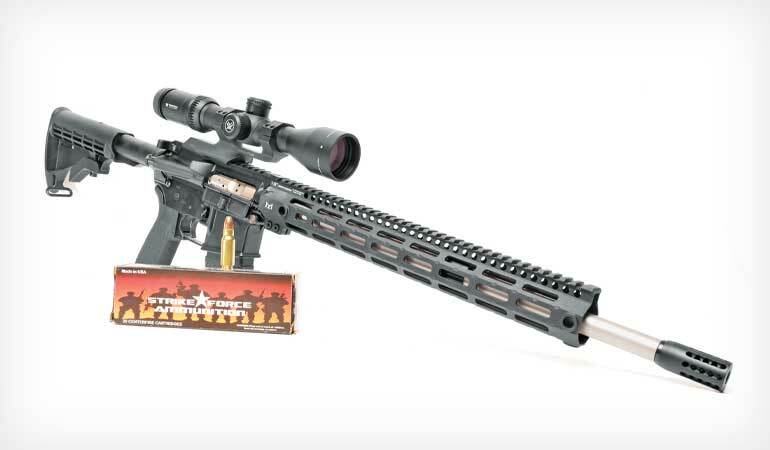 While he is perhaps best known for his work bringing the .458 SOCOM cartridge successfully to market, eventually he felt the need to hot-rod even that. This led to the midsize .375 SOCOM. While not as well known as its bigger brother, the Tromix .375 SOCOM is perhaps a bit more practical. Basically a necked-down .458 SOCOM, it is capable of pushing a 200-grain bullet at nearly 2,400 fps from an AR-15. The result shoots much flatter while still hitting hard. Like the .458 SOCOM, the Tromix .375 SOCOM has the rim rebated to 0.473 inch. Case length is 1.575 inches, and the cartridge overall length is 2.260 inches. This allows it to fit neatly, single-stacked, in a standard AR-15 magazine. Base diameter is a fat 0.541 inch with a neck diameter of 0.405 inch. Bullet diameter is the common .375 inch, so a wide variety of projectiles are readily available. Maximum pressure of the cartridge is 35,000 psi. Like its bigger brother, the .375 SOCOM was specifically designed for use in an AR-15. No changes need to be made to a standard AR-15 lower. A standard upper will also work. All that’s needed is a .375 SOCOM barrel, bolt and a muzzle device of the proper size. Tromix offers a variety of barrel options from 10.5 to 18 inches if you’d like to build a .375 SOCOM. Or, if you’d prefer, the company also offers complete upper receivers, including left-hand ejection. The million dollar question, though, is, “What about ammunition?” The good news is factory ammunition is also readily available. SBR Ammunition and Strike Force Ammunition both offer a variety of factory loads for hunting and target shooting. These range in weight from 175 to 250 grains. Black Butterfly Ammunition offers remanufactured ammunition in .375 SOCOM. And you can always roll your own. Dies and data are readily available. SBR Ammunition also offers headstamped brass. Recommended powders are AR-Comp, AA2520, VV N530, VV N135, VV N140, IMR 4895, Varget, Reloder 15 and H4895. How does the .375 SOCOM perform? To find out, I requested an upper from Tromix and received a good-looking piece well suited for hunting. It was built on a standard flattop upper receiver with the ejection port opened up to ensure reliable operation with those fat cases. Inside the upper is a nickel/boron bolt carrier assembly with a properly staked gas key and 0.473-inch bolt. Mated to the front of the receiver is a lightweight 18-inch stainless steel match barrel. The upper features a mid-length gas system, 1:12 twist and a threaded muzzle. A compact 40-port muzzle brake tames felt recoil. Surrounding the barrel is a lightweight Midwest Industries free-floating handguard with M-Lok slots. This has five QD sling points and the ability to easily mount accessories such as a bipod or white light. 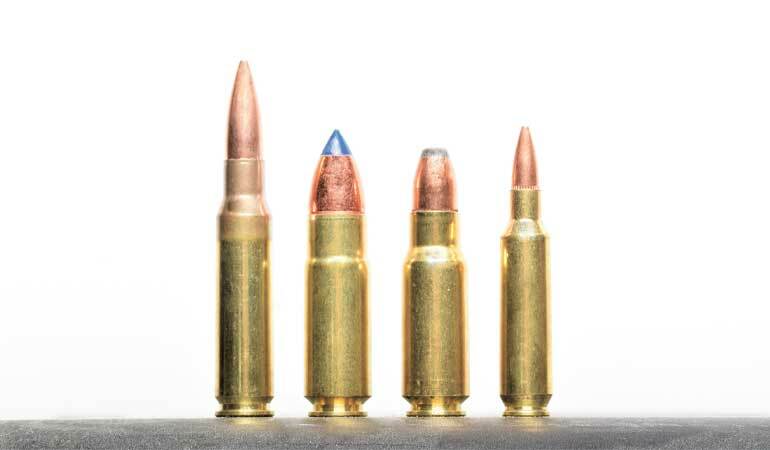 L.-R.: .308 Win., .458 SOCOM, .375 SOCOM and 5.56. The .375 SOCOM is basically a .458 SOCOM necked down to accept the popular .375-inch family of projectiles. Slapping the upper onto a lower receiver revealed it to be a light and handy setup Weight with a Vortex 2.5-10x44mm Viper scope, mount and empty magazine came in at 8.2 pounds. The 18-inch barrel is a good length for hunting, providing a bit more velocity over a shorter tube while still handling well in brush or from a tree stand. The rifle balances well, is quick the shoulder and fast to swing. I headed to the range with two different loads from Strike Force Ammunition. These consisted of a 200-grain Sierra softpoint and a 200-grain Vollmer softpoint. Recoil of the .458 SOCOM is pretty noticeable, so I was interested to see how hard kicking the .375 SOCOM is. And with the first shot I was surprised by how mild it is. The way the rifle is gassed and the effective muzzle brake make this a pleasant rifle to shoot, even from the bench. Accuracy from a rest at 100 yards was good with the 200-grain Vollmer load averaging 1.3 inches at 2,365 fps. The 200-grain Sierra load averaged two inches at an almost identical 2,367 fps. Moving from the bench, I shot some steel plates at 100 yards offhand and then 300 prone. The included 5.56x45 20-round Lancer L5-AWM magazine holds eight of the big .375 SOCOM cartridges. It loads easily and fed flawlessly. Ejection was right at three o’clock. The 200-grain slugs rocked the steel nicely at 100 yards and at 300 yards gave a nice “thwak.” With the right projectiles the .375 SOCOM does indeed shoot a bit flatter than its bigger brother. Plus, follow-up shots are noticeably faster. All in all, I like the Tromix .375 SOCOM. It would make a dandy pig, whitetail or black bear gun. Ammunition and brass are a bit pricey, but that is the only downside. If you’re a fan of the .375 bore, or you just like the concept, Tromix offers many choices to choose from when it comes to an AR upper. Barrels start at $299 and uppers at $749.